Greeks did not had any problems with the Name Macedonian back in the 80's - republic-of-macedonias jimdo page! Greece did not have any problem with the name Macedonia in before the nineties and the independency of the Republic of Macedonia. As seen in official Greek governmental documents 1988 untill 1991. The documents are diplomatic anouncements between Greece and the then Socialist Republic of Macedonia in which is described that the general Greek consul in Macedonia has been changed. 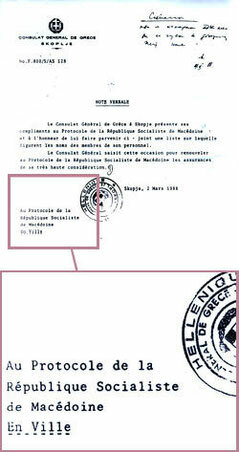 On the documents it is clearly visible that official Athens did not have any problem with the name Macedonia.